On Saturday, at Nunholm, APD Dumfries play their first home Western Premier League fixture of the season against Renfrew. The Renfrew side were promoted last year after winning the Western First Division. The sides have met regularly in previous seasons and the visitors will be looking to experienced professional, Ahmed Said, back for seventh season, and who already has an unbeaten century in the Scottish Cup this season. South African all-rounder Hendrickse, the visitor’s overseas amateur, will also want to make an impact after a rain affected start to the season. With all last weekend’s games off due to the weather Dumfries will need to shake off the rust with skipper Scott Beveridge aiming to lead from the front and Scotland U19 pace bowler Niall Alexander having successfully shown his abilities in an extended spell in the Scottish Cup match at Heriots, which had to be restricted by the ECB Fast Bowling over limits for young bowlers. 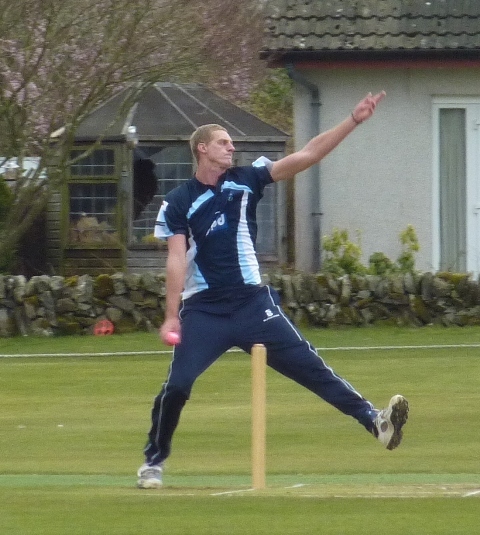 Dumfries’s opening bowler, Peter Lojszczyk, played for the Border Reivers on Wednesday in their LiveSport.co.uk Pro Series win against the Highlanders at Ayr. The Pro series provides a platform for the introduction of professional cricket at domestic level in Scotland and the future establishment of a first class structure. Lojszczyk, who joined the Nunholm club at the start of the season, is the latest Scotland cap prospect who qualifies through the recently changed ICC’s parentage rule. Across from the Western Suburbs Club in New South Wales, Australia, he owes his chance to his mother, appropriately from Galashiels in the Borders. The second eleven, Eco-Genics Nunholm, travel to play Renfrew seconds, Dean Park and on Sunday Dumfries play at Kelso in the Murgitroyd Borders Twenty20 competition. The winners then play at St Boswells in the semi-final the same day. Dumfries has managed to win through to the National Finals each year, but with the exception of last season after a sodden bowl-off loss to Sunday’s opponents – Kelso. Also on Sunday Dumfries Women have a re-arranged fixture away at George Watsons in the Women’s National League. Junior Coaching: Monday night junior sessions take place at Dumfries Sports Club, Nunholm, from 6:15-8. These are aimed at juniors aged 8-14 and are open to those wanting to have fun learning a new sport, boys and girls, open to non-members, with a free try for first-timers. Womens Cricket: The Club’s Womens’ and Secondary Girls training takes place on Fridays from 5 to 7.